Meditation is a form of mental discipline. There are many forms and styles of meditation. One is to follow or focus on your breath. Other people may meditate while focusing on an icon or object. Reciting a mantra can be useful for other people. Guided meditation in which one imagines a scene or event can also be used. 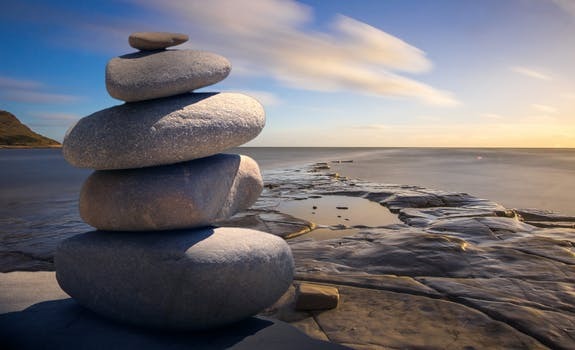 The regular practice of meditation has been found to be useful in reducing stress, enhancing physical and emotional health, and improving life satisfaction. It has become common knowledge that meditation masters like Buddhist monks can achieve amazing things through the power of their minds. Now scientists at Wake Forest Baptist Medical Center have identified the brain area involved. A report in Science Daily revealed that the anterior cingulate cortex that governs thinking and emotion and the ventromedial prefrontal cortex that controls worrying are both impacted by meditation. The activation of these two areas can reduce anxiety ratings by almost 40%. Just think of it – no medications, no side effects, no doctor bills, increased tranquility, and increased wellbeing. Give it a try. I’ve included a basic meditation exercise for you below. Sit comfortably. You can sit on a floor, a cushion, or a chair. Avoid positions that are so relaxed that you might fall asleep. Close your eyes. This will help to reduce distraction. If closing your eyes causes anxiety for you, gaze gently at an object. Take a few deep breaths. Then, breathe naturally. Some people find it helpful to breathe in through the nose and out through the mouth. Focus on your body sensations including the points of contact between you and the world. Is there warmth, tingling, pressure, or vibration? Whenever your mind wanders away from your breath (and it will! ), gently return to noticing your breathing. It is not necessary to judge these thoughts or reprimand yourself for your mind wandering. The ability to disconnect from our thoughts takes practice. F. Zeidan, K.T. Martucci, R.A. Kraft, J.G. Coghill. Neural Correlates of Mindfulness Meditation-Related Anxiety Relief. Social Cognitive and Affective Neuroscience, 2013; DOI: 10.1093/scan/nst041.